Log In Not a member? Click here to Register now! We hope you enjoy this site!! If you have any suggestions that will make this web site more beneficial, please feel free to submit to Technical Submission. 4/16/2019 HP updates and 2019 Dodge 1320 Chanllenger updates. 9/20/2017 to correct an error calculating FWD stock. Welcome to the first site to be a technical clearing house for data and information for NHRA and IHRA class racers. The flagship product here is the copyrighted TECHNICAL TOOLS. We do the hard work for you so you can quickly and easily get to the information you need to plan, enjoy, research and dream! We ask you to register as a user to have access to the tools since there are some disclaimers you must agree with in order to use them. Have fun! 1) 1963 MoPar Max Wedge Hi Comp 426-425hp increased from 403 to 409 in Stock. 2) 2015 Dodge 426-460hp increased from 460 to 466 in Stock automatic. 3) 2019 Dodge 392-390 increased to 413 across the board. 1976 Ford Mustang 302-133hp increased from 158 to 167 in Stock. 2010 Ford 428-375hp increased from 422 to 436 in Stock automatic. 1976 Ford Mustang 302-133hp increased from 153 to 158 in Stock. 2/4/19 Corrections and addtions published by NHRA For Class Guide and Tech bulletins. 2019 FSS cars and engines added for Ford, Chvrolet and Dodge. Corrected shipping weight on 1978 Impala 305. 1/22/19 Corrections and addtions published by NHRA For Class Guide and Tech bulletins. 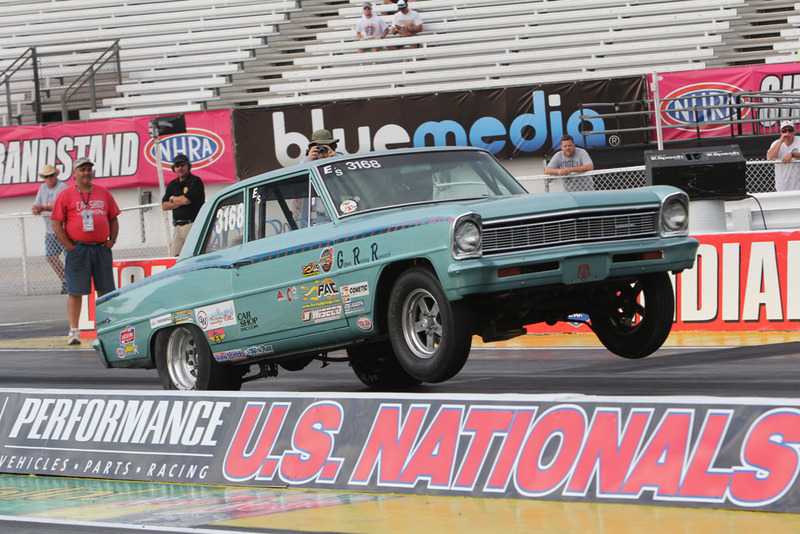 See the lists from NHRA here (AHFS list) and here (Competitor Request list). 2016-18 Chev COPO 350-580hp increased from 580 to 617 in Stock auto. 1973 Ford 302-138hp increased from 146 to 150 in Stock. 1978 Ford 302-139hp is Auto only in Fairmont and Zephyr. 1987 Camaro & Firebird 305-155/165hp is 262hp for Stock Auto. 1994-96 Chev 265-200hp is Auto only in SS/GT. 2012-15 Chev 427 cylinder heads. 2013-15 Chev COPO 350-350hp increased from 377 to 394 in Stock auto. 9/20/18 Corrections published by NHRA For Class Guide and Tech bulletins for 1976 and 1986 Ford 140 4-cyl. Added and updated some items in the Accepted Products. 7/24/18 Corrections published by NHRA For Class Guide and Tech bulletins. 7/2/18 Mid Year 2018 AHFS HP ratings updates. More inconsistencies. 6/20/18 Update HP on 94-97 Buick Roadmaster LT1; add Z28 to 1983 Camaro CG page. 1970 Chevrolet 350-300hp in 1970 Camaro decreased from 296 to 286 for Stock auto. 4/16/18 Removal of the Jones Engineering head as an accepted replacement for 62-70 SBC. 69-70 Chevrolet 350-300hp in Camaros increased from 286 to 296 for Stock auto. 1990-91 Corvette 350-247 & 250hp increased from 273 to 282 for Stock auto. 1976 Ford Mustang 302-133hp increased from 140 to 151 in Stock auto. 4/3/18 Updated NHRA Accepted Products data, specifically a new head for 1962-70 Chevolet small blocks that use a "double hump" head. 93-98 Chevrolet 350 LT1 in Camaros and Firebirds reduced from 370 to 358 for Stock auto. 1) 93-98 Chevrolet 350 LT1 in Camaros and Firebirds from 358 to 370 in Stock auto. 2) 1070-71 Mopar 426 Hemi in 'Cudas and Challengers from 434 to 449, in Stock auto. 3) 1976 Ford Mustang 302/133 from 133 to 140, in Stock auto. 4) 1967 Shelby 428/355 from 382 to 395, replacement heads in Stock auto. 1973 & 74 Pontiac Firebird 455/250 reduced from 321 to 310 for SS. Another 302 Ford hit. 1978 Fairmont-Zephyr raised from 141 to 146 for Stock Eliminator. 1973 & 74 Pontiac Firebird 455/250 raised from 310 to 321 for SS. 3/1/18 Updated various NHRA Accepted Products data, specifically a new head for medium riser Fords, runner volume specs for SS '69 AMXs and a new piston for 421 Pontiacs. Another hit for the 1986 Chev Pickup. 350-165 raised from 222 to 230 for Stock Eliminator automatic. 1/31/18 Updated various NHRA Accepted Products data. See the list from NHRA here. 1/18/18 HP factor corrections from NHRA due to some clerical errors. 1969 427 ZL1 Camaro and 1975 Chev 400-175. 1/1/18 End of Year 2017 Updates applied to the database. Another 302 Ford hit. 1975 Mustang raised from 144 to 149 for Stock Eliminator. Another 302 Ford hit. 1974 Maverick and Comet raised from 146 to 151 for Stock Eliminator. 10/8/2017 Separated the A & G models of Buicks from 1964 thru 1987 so the pages would be easier to read. 9/20/17 NHRA Tech Dept HP adustment for '95 Buick Roadmaster LT1 engine to match the numbers for Chevrolet. Another hit for the 1978 Buick Regal 231-150hp raised from 160 to 167 for Stock Eliminator. 8/28/17 NHRA Tech Dept HP adustment for '64 289-210hp Comet from 197 to 200 for Stock. Another hit for the 1986 GMC pickup 350-165hp raised from 212 to 222 automatic, and the 1978 Buick Regal 231-150hp raised from 154 to 160 for Stock Eliminator. 8/15/17 NHRA Tech Dept HP adustments for '67 426-425hp Hemis, '68 Mustang Cobrajet, '79 Malibu 305-160hp, and '71 Corvette 454-365hp. Another hit for the 1976 Ford 302-133hp raised from 153 to 163 for Stock Eliminator for the Maverick, Comet, Granada and Monarch, thanks to the Grahams. The Mustang missed it again! 6/21/17 A special thanks goes out to Rick Thomason for helping me by pointing out an error on the web site. Thanks, Rick!! 6/14/17 HP adustment to correct 1983 305/200 Chev and add a cylinder head to 2012-15 Chev 427/425-430 specs. 1983-87 Chevrolet 305 with hp ratings from 155 to 200 from 263 to 275, Auto in Stock. 2) 2017 Chevrolet COPO 350/590 from 590 to 616, Auto in Stock. 5/16/17 2015-17 Dodge Hellcat added. Additional specs for 09-10 354-540 Dodge engine. 1) 63-64 Dodge & Plymouth 383/330 from 280 to 292, All in Stock. 2) 2010 Ford Cobra Jet 352/285 from 349 to 361, Manual in Stock. 3) 2016-17 Chevrolet COPO 376/410 from 410 to 424, Auto in Stock. 4) 1978 Chevrolet 350/160 from 283 to 293, Auto in Nova, Omega, Phoenix in Stock. 5) 1994-96 Chevrolet 265/200 from 214 to 221, Auto in SS/GT. 6) 2014-15 Chevrolet COPO 350/530 from 542 to 560, Auto in Super Stock. 7) 2011-13 Dodge Challenger 392/380 from 389 to 402, Auto in Stock. AHFS adjustment on the 2015 Dodge Drag Pak 354/530 from 530 to 558 for Stock auto. This is the iron block engine. 1) Add intake manifold number to 66-67 MoPar 273 180hp. 2) Clean up some hp factors for '77 Chev 350 170hp. 3) Clean up hp factors for '64 MoPar 426W 425hp. 4) Clean up hp factors for '70 Dodge Challenger 440 390hp. 2/10/17 2017 COPO Camaro and Mustang Cobrajet added. Also updates to 2015 DragPak engine specs. See the lists from NHRA here. Added new SS/GT and SS/FGT classes and indexes for 2017 season. 2) AHFS adjustment on the 2013-15 COPO Camaros 350/350 from 355 to 367 for Stock auto. 1) Add replacement cylinder heads to 80-92 Chev 305. 2) Add replacement cylinder head to 93-98 Chev 350 LT1. 3) Correct HP for 78-89 Mopar 318s and 360s w/ replacement heads. Supercharged 2016 Ford 302-133hp raised from 575 to 600 for Stock Eliminator. Automatic only. Another hit for the 1976 Ford 302-133hp raised from 138 to 149 for Stock Eliminator for the Maverick, Comet, Granada and Monarch. The Mustang missed it again. 7/27/16 From NHRA Tech: Add the 376-365hp engine to the 2015 Chev Tech Bulletin and the Camaro SS. 1) 1971 Chrysler 318-230 intake manifold number. 2) 1988 Chevrolet 350-230 added a casting/part number for the throttle body. 3) 2016 Ford 302-385 added numbers for the throttle body. 1970 Dodge 440-390 changed from 400 to 382 with automatic transmission in Stock classes for the Challenger. 1971 Chevrolet 454-425 with iron heads corrected back to 424 from 447 with automatic transmission in GT/Super Stock classes. 1) A hit this time for the 1975 Ford 302-129hp raised from 134 to 140 for Stock Eliminator in the Mustang. 2) 1971 Chevrolet 454-425 with iron heads raised from 424 to 447 with automatic transmission in GT/Super Stock classes. 2) 1977 Chevrolet 350-170 in the Oldsmobile Cutlass changed from 287 to 270 for automatic transmission in Stock Eliminator. Buick Century/Regal using the same engine is still 287. Stick is 275. 3) 1971 Monte Carlo 454-425hp is changed to 414 in Stock Eliminator so it is the same as the Chevelle. A hit this time for the 1976 Ford 302-133hp raised from 133 to 138 for Stock Eliminator in every body style except the Mustang. Hmmmmm. . . . Strange pattern here - how is the Mustang dodging the bullet? 1975 Ford 302-129hp finally increased some from 129 to 134 for Stock Eliminator in the Mustang. 2016 COPO Camaro added to the Class Guide and the 2016 Chevrolet race engines added to the Tech Bulletins. 2013 Chevy Camaro with the 396-390hp engine manual transmission only raised to 414 from 404 for Stock Eliminator. Another hit for the 1986 Chevy Pickup, 350-165hp manual transmission raised to 203 from 212 for Stock Eliminator. Another hit for the 1975 Ford 302-122hp & 129hp raised from 152 to 164 for Stock Eliminator in every body style except the Mustang. Hmmmmm. . . .
3/21/16 NHRA Tech Department changes for engine specs. 1) Added MoPar cylinder head #P5155469 to 68-79 selected 318s, 340s and 360s for SS and 92-02 Dodge Trucks 318s and 360s for Stock Eliminator. This is a MoPar Performance replacement head for Magnum engines. 2) 1967 Ford 427-425 gets a couple of additional carburetors added. 3) 1977 Ford 302 122-137 hp engines get cylinder head and intake manifold casting numbers corrected. 2010 Ford Cobra Jet 352-285 hp raised from 338 to 349 for automatics in Stock Eliminator. 1) Another hit for the 1975 Ford 302-122hp & 129hp has raised from 139 to 152 for Stock Eliminator in every body style except the Mustang. BJ, you need to find a Mustang body. 2) 2000 thru 2005 Chevrolet 207-170 & 180 hp raised from 174 to 180 in Stock Eliminator. Oldsmobile and Pontiac using the same engine is still at 173. 3) 2014 Ford 429-455 hp shootout Mustang raised from 455 to 484 in Stock Automatic only. Stick is still 455. 1/26/16 Second round of year end horsepower factor changes and tech bulletin changes are added. Seems they missed a few the first time. 12/20/15 All the year end horsepower factor changes and tech bulletin changes are in!! See the list from NHRA here. 1) 1975 Ford 302-122hp & 129hp raised from 132 to 139 for Stock Eliminator in every body style except the Mustang. 2) 1981 Pontiac 301-200hp Firebird turbocharged engine raised from 225 to 233 in Stock Eliminator. A Neil Smedley legacy. 1) 2008 Ford CobraJet 330-425hp raised from 519 to 536 in Stock, automatic trans. 2) 2015 Dodge DragPak 426-460hp raised from 466 to 482 in Super Stock, automatic trans. 8/17/15 2015 Dodge supercharged engines added and class guide updated. 8/3/15 HP Corrections to calculations for the GT/Truck classes. Added text 'AB' to show deck clearances above the block. 7/14/15 Mid Year 2015 HP Updates from NHRA Tech added. 7/2/15 Database updates: 1987 262 V6 Chev engine specs added. Monte Carlo & El Camino weight breaks added for the engine. 5/26/15 Changes following the LODRS 1-2 Reading, PA race. 2009-10 426-450hp Dodge Drag Pak increased from 450 to 474 hp. 5/21/15 Tech changes to the accepted fuel list for Sportsman racers. 5/19/15 HP adjustment following the LODRS Norwalk race. 2013 302 supercharged Mustang hit again. 5/13/15 Corrections to calculations using different power factors for replacement heads. SS/GT can use engines from same year as car. 5/6/15 Database updates: 2015 Dodge added; added replacement cylinder heads for 68-71 340 MoPar and 87-92 305 Chev. 4/17/15 New Logo and New feature: Added flow data for some cylinder heads. 3/31/15 Stock HP changes after Charlotte: '68-'69 iron head 396-375hp auto and '93-'98 LT1 auto. Thanks, Guys! 3/24/15 That pesky 1978 302 Mustang got tagged again for 7 more hp. 2/24/15 2015 Chevrolet COPO data added to the database. 1/8/15 Additional AHFS HP factor changes for the end of the 2014 season. NOTICE!! Updated 12/26/2014 Classification programming and database changes for the new FS, FSS and FGT classes is ready to use. 12/23/14 Classification for the new FS and FSS classes added. 12/19/14 End of year horsepower changes are added to the database. Check out how it affects your car! NOTICE!! Updated 12/18/2014 NHRA has released all the end of the year horspower changes. See their lists here. 12/17/14 NHRA has published a new approved fuel list here. 11/19/14 Some minor database corrections and fix a programming bug. 2008-up Fords corrected. NOTICE!! Updated 11/4/2014 NHRA has published amendments to the rule book that will go into effect on Jan 1, 2015. This is a preview of what the 2015 rules will be. Read their not-so-clear-and-understandable publication here. 9/16/14 Tech Specs Changes: 2011 Ford 302/325 & 380 piston dome specs updated. Class Guide Change: 1982 Ford 302/157 is now manual only in Capri and Mustang. 2. The 86 Chev Truck 350/165 combo got 9hp. 3. The 2013 & '14 COPO Camaro 396/390 combo got 29hp in Stock. 4. The 2009 & '10 Dodge Drag Pak 345/305 Hemi stick combo got 32hp in Stock. 5. The 2009 & '10 Dodge Drag Pak 360/275hp combo got 9hp in SS. 6. '87-'92 Chev and Pontiac 305 hi-compression TPI combos got 10hp for SS/GT FWD. 8/19/14 2011-2013 MoPar 392-380hp added to the Tech Specs and added to the Class Guide for 2011-2013 Challenger. 1969 AMC 290-225 power rating changed to 210, SS only. 1986 Chev Truck different ratings for Man-Auto added. 1970 Dodge Dart/Challenger separated from full size cars. 8/5/14 Tech Specs Changes: 1978 Ford 302/139 carb specs added.